The word brain tumour can be scary for everyone. 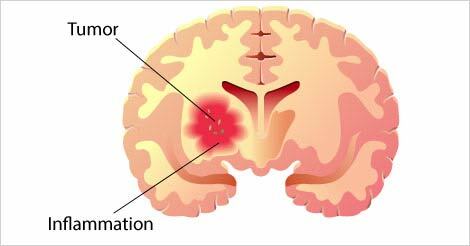 A brain tumour is a collection of uncontrollable and abnormally grown cells in the brain. Brain tumour can cause pressure on the brain and brain being a vital organ this condition might be life threatening. These tumours grow inside the brain and may spread to the nearby parts of the body. These tumours may also originate in the brain cells, membranes surrounding the brain, nerve cells, and glands. These tumours spread from other parts of the body to the brain. Lung cancer, breast cancer, kidney cancer and skin cancer and its later stage spread to the brain. The exact reason of brain tumours is still unknown. However, doctors believe that brain tumour risk factors include family history, age, race and exposure to chemicals or radiation which can cause a brain tumour. If the doctor notices one or more symptoms in a patient, he/she is suggested the MRI scanning. A detailed neurological examination, evaluating muscle strength, coordination, memory, and ability to do numeric problems can help in the brain tumours diagnosis. Other than that, procedures like Angiography, X-ray and biopsy are performed to determine the presence and stage of the tumour and to identify whether it is cancerous or not. Surgery: the surgeon removes the tumour as much as possible without causing any damage to the healthy part of the brain. Surgery is combined with other treatments such as radiation therapy and chemotherapy. After the surgery, the patient will need physical therapy, occupational therapy and speech therapy to overcome the side effects of neurosurgery. The doctors have different thoughts over brain tumour causes; however, a definite diagnosis may help in getting rid of a brain tumour at an early stage which might help in preventing brain tumour. You need to remember that regular preventive health checkups can help take timely steps to avoid any health complications. Also when diagnosed at an early stage, the tumour growth can be prevented from getting worst to an uncontrollable stage and change into brain cancer. If you have been experiencing above discussed symptoms frequently, undergoing a right health checkup immediately is advised. Please fill up the query form and talk to our executive who will be able to help you solve your queries and suggest a suitable health checkup.